The fact of the matter is that data centers consume energy, a lot of energy, and that will not change. But there are ways to reduce energy consumption and find more clean ways to use energy that leave less of an environmental footprint. Most data centers use a lot of energy but they also waste a lot of energy and that is simply unacceptable. Energy efficiency must be made a priority in a data center and a plan of action must be immediately implemented on a full scale. Consolidation must take place, fewer servers means less space and less to cool. But, with a high density rack, cooling can be focused so that cooling efforts are not wasted. Additionally, containment such as hot aisles and cold aisles is one way to help improve energy usage. Another and more green option in terms of cooling is to house your data center in a cooler climate that can take advantage of natural cooling elements and reduce cooling needs within a data center. Additionally, as more and more moves to the cloud, physical infrastructure can be reduced in data centers which helps reduce cooling needs. 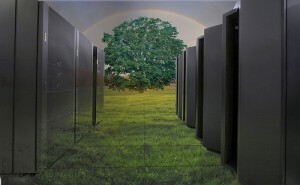 Data centers need to examine their energy usage and look for ways to not only reduce but for green options that are more environmentally friendly so that a sustainable data center future can be achieved. This entry was posted in Data Center Design and tagged Cooling System, Data Center, data center design, data center equipment. Bookmark the permalink.